Industrial Bicycles & Commercial Bikes. In larger factories and warehouse environments, getting from one end of the building to the other can take a considerable amount of time and this affects performance and efficiency. In order to help staff to get around more quickly, there are a number of options available, which all have advantages and disadvantages, and some environments suit certain solutions better than others. Industrial bicycles are one of the favored methods of empowering staff to move around the workplace, and there are a number of different options available to ensure that these are the most efficient option available. Although some companies prefer to provide electric carts, these are not always suitable, and present a large capital expense that is not always possible to justify. 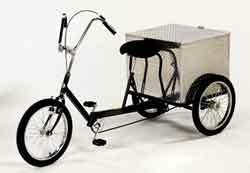 Industrial bikes offer a much more cost effective solution, as well as being more environmentally friendly. Modern commercial bikes are designed to be safe, easy to use and rider friendly. With light gearing, and comfortable saddles, coupled with plenty of space to stow any items that would otherwise have to be carried, they make for a very efficient way of getting around larger facilities, saving time and energy, and making staff more effective. Industrial bicycles come in a wide range of styles, but the most popular option with most employers is a three wheel design with a cargo box at the rear. This provides greater stability, and means that the bike can be parked safely rather than having to be propped up against a wall or fence when not required. The bikes are designed to be very durable, with strong frames that are painted to avoid corrosion, and adjustable saddles to ensure that all sizes of person can ride comfortably. Thanks to a wide range of colors of commercial bike in the Easy Rack range, you can select an option that fits in with your overall workplace theme, or even assign different bikes to different areas to ensure that they can always be found when required. Safety is always of paramount concern in the modern workplace, so these bikes come complete with heavy duty tires and effective hand brakes to ensure safe stopping on demand. The standard model can comfortably carry people weighing up to 250lb, but if you need more capacity for any additional load to be carried in the cargo box, heavyweight frames designed for up to 500 lb total capacity are also available. Thanks to the large cargo area on the back, these industrial bicycles are ideal for use in an environment such as a factory where components may be required at any station by an operator, and where getting them distributed can mean a logistic headache. Having a member of staff on hand to ensure that critical components are in the right place at the right time will definitely benefit the business in terms of reducing down time, and is just one of many reasons why so many facilities choose to enable a workforce with the means to get around easily, safely, and on demand with a commercial bike.